The variable star T Tauri was discovered on an October night in 1852 by John Russell Hind. Hind, a noted asteroid hunter, is credited with having discovered 11 minor planets, as well as Nova Ophiuchi 1848 and R Leporis (also known as Hind's Crimson Star). On this particular night, however, while scanning the sky with his telescope through the Pleiades and in the direction of the Hyades, Hind spotted a tenth magnitude star that was missing from the charts that he was using. The missing star, as it turns out, was the variable now known as T Tauri - the third variable to be discovered in the constellation of Taurus. Hind's Nebula can clearly be seen as the ghostly figure to the west of T Tauri in this STScI Digitized Sky Survey  image. Observers have since found that T Tauri is not the only interesting object in the area. Not far from T Tauri is Hind's Nebula (NGC 1555), a reflection nebula that is illuminated by its variable neighbor. As a result, the brightness of the nebulosity varies with changing illumination given by the star itself. The nebula was observable between 1852 and 1861, but then began to fade from view. Only faint traces of the nebula were visible with the largest telescopes of the time up until the mid-1860s, and by 1868 it disappeared completely from telescopic view. The nebula was not seen again until 1890 when it was observed by E.E. Barnard and S.W. Burnham. It again vanished, but traces were seen only with photographic means in 1899. In 1920, the phantom nebula began to again brighten gradually. The nebula has steadily brightened since the 1930s, but still remains a challange for many to observe. Then in 1890, nearly 40 years after the discovery of T Tauri, Shelburn Wesley Burnham found that T Tauri itself is situated within a very small nebula. At the time, T Tauri had been feebly shining at 14th magnitude - at the limit of most telescopes of the time. The condensed nebula appeared to be about 4 arcseconds in size in its longest dimension. T Tauri has been brighter than 10th magnitude since the early 20th century making this feature near impossible to detect. Burnham's Nebula, as it has come to be called, can be detected in an overexposed image of the star as a bulge extending about 10 arcseconds from the variable. Unlike NGC 1555, Burham's nebula is not believed to be a reflection nebula. Scanning the sky just 30 arcseconds west of the brightest point in Hind's nebula we find another interesting object: a filament or jet known as a Herbig-Haro object. Jets of such type are commonly linked with "young, mass-ejecting stars." Although these objects are mainly detectable in the infrared, those from which visible spectra can be obtained suggest that the source star could be a very active T Tauri star. In 1981 it was discovered that T Tauri has a companion star. Through use of the Very Large Array  it was found that the companion, which makes itself visible in the infrared, sits somewhere between 0.5 to 0.7 arcseconds south of the visible mate. Thus, the optical star is refered to as T Tau N and the infrared companion as T Tau S. Further research has revealed that T Tauri may in fact be a triple system. Interest in T Tauri-type stars is peaked even further since they have been found to represent a very early stage in the the process of stellar evolution. As such, they are commonly surrounded by a dusty disk that could conceivably harbor a nascent planetary system and may provide clues into the formation of our own solar system! T Tauri stars are named for the prototype of the class, T Tauri. These objects are pre-main sequence stars and have recently emerged from the opaque envelope of stellar formation. Having recently coalesced from their dusty and gaseous surroundings, these stars now become visible at optical wavelengths. The clouds of dust and gas that condense are composed of mainly Hydrogen, some Helium, and some other trace elements. The clouds also contain small amounts of Lithium which is usually destroyed as the star evolves to the main sequence stage of life. Hence, Lithium is often an indicator of stellar youth. This spectral feature is seen in the atmospheres of the T Tauri stars, which implies, in the astronomical sense, that T Tauri stars are a young, low-mass stars that are contracting as they evolve toward the main sequence stage of stellar evolution. These stars often have large protoplanetary accretion disks left over from stellar formation. The general belief is that T Tauri stars are newly forming stars in the galaxy and may be growing in size through accretion. Brightness changes detected in these stars are not due to evolutionary effects, per se, but may be due to such processes as instabilities in the disk, violent activity in the atmosphere of the star, and may also be due in part to moving clouds of dust and gas from which they were conceived. "Stars with masses roughly 0.2 to three times the Sun's and with ages 100,000 to 1,000,000 years typify the T Tauri regime" (Cohen 1981). Many of the T Tauri stars are found to reside in or near areas that are hidden by the Milky Way clouds. "We now know why this is so: those stars were born in those dark clouds, within the last 10 million years or so, and there has not been enough time for them to move very far from their birthplaces" (Herbing 1987). The Taurus-Auriga dark cloud is a known hot-bed of such stars. Our own Sun presumably passed through the T Tauri stage some 4 1/2 billion years ago. Therefore, these stars may be able to offer us a peek into the evolution of our own Sun, solar system, as well as other planetary systems. The above images  show bubbles of emerging gas leaving the young XZ Tauri binary star system (of T Tauri type) that resides in the Taurus star forming region. Studies of such areas could give astronomers a glimpse into the development of these systems. Image credit: J. Krist (STScI) , the WFPC2  Science Team, and NASA . Unlike many other types of variable stars, classification of T Tauri variables cannot be based upon their lightcurves. The behavior of these young stars is just too erratic as found by Alfred Joy in 1945: "The variations in light of the T Tauri stars are so irregular and unpredictable that classification by means of their lightcurves is practically impossible. Thus far, observations have been insufficient to determine definite sequences of light changes which are uniquely characteristic of the group." The belief still holds true today since the lightcurves of T Tauri stars continue to show variability over a wide range of amplitudes and durations. Based on historical records, the behavior of T Tauri varied irregularly between 9.3 and 14 between 1864 and 1916, with a deep minimum between 1888 and 1891 (Isles 1997). During this time, the deep minimum resembled the lightcurves of the R Coronae Borealis  stars. In 1916, AAVSO observers began monitoring this curious star and have been diligently watching it ever since. The long-term lightcurve of T Tauri (see the AAVSO Lightcurve Generator ) shows that variability takes place over several time scales. The overall long-term trend shows that the star brightened a bit in 1967, followed by a slight dip, with a return to the brighter state in 1984. On a short-term basis, the star varies by a few tenths on nearly a daily basis and without any discernable pattern. Currently the star can be found flip-flopping between magnitude 9.3 and 10.7. The above plot shows a typical 200-day oscillatory interval of the variable T Tauri, as taken from the AAVSO International Database . The plot is based upon one-day means, and lines connecting the observations have been added as a visual aid. Just when one thinks that there seems to be order within the disorder of the lightcurves, a non-conformist arises from the mix. One curious T Tauri-type star worthy of mentioning is that of VY Tauri. Herbig notes that this variable is "an odd variety of T Tauri star, having a lightcurve rather like SS Cygni at first glance, but with maxima from one to many years apart: a very interesting object." Who really knows what these young stars will be up to next? Since T Tauri-like stars cannot be classified based on their lightcurves, astronomers have scrambled to find a common link between these unusual stars. In 1945, Alfred Joy was the first to systematically study and categorize these stars. The common denominator, he found, is their peculiar spectra. He chose T Tauri to be the protoype of the class since "it is best known, is among the brightest, and represents the group with respect to both emission and absorption spectra." Up to this point, these stars had been classified as irregular variables. Hundreds of T Tau stars are now known, and have been mainly found through spectroscopic searches. "Eleven irregular variable stars have been observed whose physical characteristics seem much alike and yet are sufficiently different from other known classes of variables to warrant the recognition of a new type of variable stars whose prototype is T Tauri. The distinctive characteristics are: (1) irregular light-variations of about 3 mag. (2) spectral type F5-G5 with emission lines resembling the solar chromosphere, (3) low luminosity, and (4) association with dark or bright nebulosity...They are situated in or near the Milky Way dark clouds in the direction either of the center of the anticenter of the galaxy...Although little or nothing is known as to the cause of the light-variations, characteristics 1-4 are probably physically interrelated and together form a distinct stellar type which may be readily recognized. These stars differ from other known variables, especially in their low luminosity and high in the intensity of bright H and K in their spectra. The well-known variable T Tauri is one of the brightest stars of the group and may properly be considered as the prototype, although there are marked differences among the stars and no two are exactly alike." Herbig later refined Joy's criteria on the spectroscopic basis which included emission lines of H and K, as well as CaII, the FeI lines of 4036 Å and 4132 Å, the [SII] lines of 4068 Å and 4076 Å, and also with Lithium in the absorption spectra (Kuhi and Cram 1989). With Lithium, again, being an indicator of stellar youth. T Tauri stars can further be divided into two types and are based on spectroscopic characteristics that arise from their disk properties: the classic T Tauri and weak T Tauri stars. Classical T Tauri stars possess extensive disks that result in strong emission lines in their spectra. Weak-lined T Tauri stars are surrounded by a disk that is very weak or no longer in existence. The weak T Tauri stars are of particular interest since they provide astronomers with a look at early stages of stellar evolution unincumbered by nebulous material. Where has the disk material gone? Perhaps into planetesimals, which could collide together to form planets. The small group of stars named after the FU Orionis prototype are also very interesting. First classified as a slow nova in 1939 when it emerged from a small dark cloud not too far from Betelgeuse, it is now believed that the activity of FU Orionis (and similar stars) is related to the T Tauri variables. While T Tauri variations may result from instabilities within and interactions with the surrouding accretion disk, FU Orionis (also known as FUors) activity results from a dramatic increase in instability and the dumping of large amounts of matter on the accompanying star (Kaler 1999). "Roughly half of the 11 commonly accepted FUors have been observed to rise 3-5 magnitudes in optical or near-IR brightness on timescales of 1-10 yr" (Kenyon et al. 2000). The remaining half show some additional features including association with optical jets and HH objects. It is speculated that perhaps all T Tauri stars probably go through FU Orionis-type behavior one or more times in their development (Herbig 1987). T Tauri's location can be found relatively easily in the night sky. 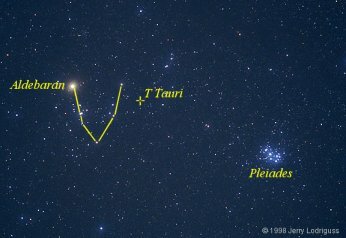 Starting from the Pleides then jumping to the "V"-shape feature of the Hyades, T Tauri is located near epsilon Tauri - the star that forms the opening of the "V" figure with the bright star Aldebaran. Magnitude estimates can then be made with AAVSO star charts . Given T Tauri's unpredictable state, observers should plan to observe T Tauri and alike once a week. Boss, Alan P. "Companions to Young Stars." Scientific American, May 1996, online article. Burnham, Robert, Jr. Burnham's Celestial Handbook (3 Volumes). New York; Dover, 1978. Cohen, Martin. "Are We Beginning to Understand T Tauri Stars?" Sky & Telescope, October 1981, 300-303. Herbig, George. "The T Tauri Stars." Journal of the AAVSO, 16, 1987, 1-3. Isles, John. "A Variable Star and a Variable Nebula." Sky & Telescope, November 1997, 98-100. Joy, Alfred H. "T Tauri Variable Stars." Astrophysical Journal, 102, 1945, 168-195. Kenyon, Scott J., E. A. Kolotilov, M.A. Ibragimov, and Janet A. Mattei. "Flickering in FU Orionis." Astrophysical Journal, 531, 2000, 1028. Kaler, James B. "Eyewitness to Stellar Evolution." Sky & Telescope, March 1999, 40-47. Kuhi, Leonard V., and Lawrence E. Cram, eds. FGK Stars and T Tauri Stars. Washington, DC: NASA Scientific and Technical Information Branch, 1989. Reipurth, Bo and Steve Heathcote. "Herbig-Haro Objects and the Birth of Stars." Sky & Telescope, October 1995, 38-40. Robinson, Leif. "Celestial Calendar: Stalking the Variable Star T Tauri. "Sky & Telescope, October 1981, 340-341. Robinson, Leif. "News Notes: T Tauri's Infrared Companion." Sky & Telescope, October 1982, 334. Robinson, Leif. "News Notes: T Tauri's Enigmatic Companion." Sky & Telescope, August 1984, 112. Robinson, Leif. "News Notes: Naked T Tauri Stars." Sky & Telescope, September 1988, 232. Struve, Otto. "T Tauri and Associated Nebulosities." Sky & Telescope, October 1961, 197-199.